Join supporters of equality at the University of Delaware and help grow public support for marriage equality in Delaware. 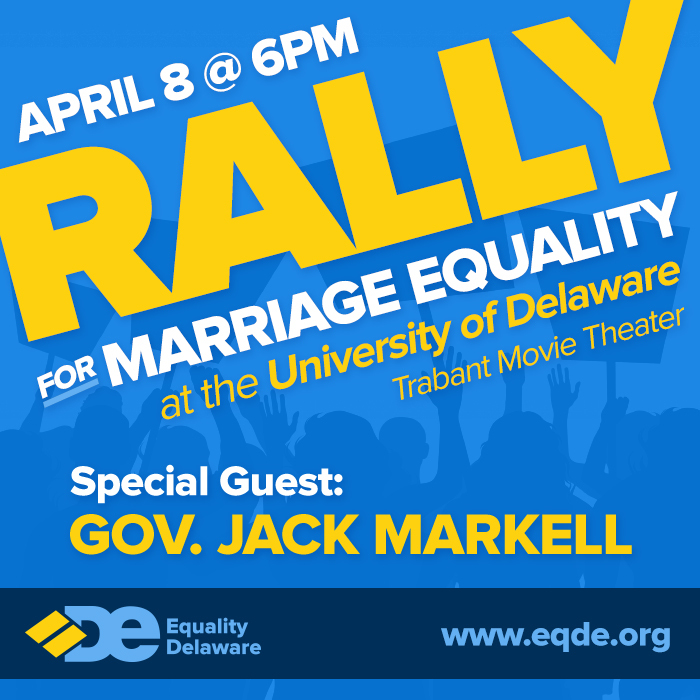 The UD Democrats, Haven, Amnesty International, Active Minds, RSA, MANNRS, SAGE, VOX, V-Day, Uganda Untold, and Deltronica are proud to present a "Rally for Marriage Equality" with the Equality Delaware Foundation and Delaware's Gov. Jack Markell, at UD's Trabant Theater on Monday April 8th at 6 PM. Join us in supporting equal marriage rights for gay and lesbian couples in Delaware and across the nation. Free to attend, doors open at 5:30 PM.